The surprise release of Subsurface Circular was, well, a surprise. It’s a short, narrative-driven experience developed in-between larger projects and designed to be played in one sitting. For me, these small scale indie efforts have provided some of the best gaming experiences available in the last few years. And while the “AAA” industry is still fixating on scale, playtime and overblown budgets, games like Subsurface Circular prove that focus is often far more important. The game takes place on the titular Subsurface Circular, an underground railway system similar to ones you’d see in any major city. Only the passengers are not human, they’re Teks; robots driven by artificial intelligence that serve to automate a variety of jobs, ranging from factory worker to childcare. Each Tek has their own level of intelligence, distinct design and personality. They’re meticulously engineered to fulfil a pre-determined task in society. The player takes on the role of a detective Tek, whose programming has locked them to the Subsurface Circular. They are forced to wait on cases assigned to them by the government, or “management” as the Teks call them. But once a mysterious production Tek asks them to look into the disappearance of their friend and the subsequent disappearances supposedly related to it, the detective manages to ignore their directives and starts looking into the mysterious event. It’s good as far as setups go and vague enough to allow for some creative twists and turns, which the game takes full advantage of. As with any good mystery, the story constantly replaces the questions it answered with new ones, but the real strength is in the writing of the individual characters. Every Tek you meet has something interesting to tell you (provided they’re not blasting music through their headphones and ignoring all of your questions), whether it be about the case you’re trying to solve or their personal lives. And their personality is really important here. Not just because most of the game revolves around talking to these Teks, but also because these personalities play into the major themes this game’s narrative is structured around. The future of both artificial intelligence and automation and the ethics behind these things is explored entirely trough interactions with AI driven robots that were designed to serve this automation. The way they talk, the way they understand and interpret certain things make them feel an awful lot like humans, be it with a few quirks. Teks feel like sentient beings capable of complex thought and this makes the question of whether automation is good or bad even more complicated. Is unfair towards humans? Is it unfair towards Teks? 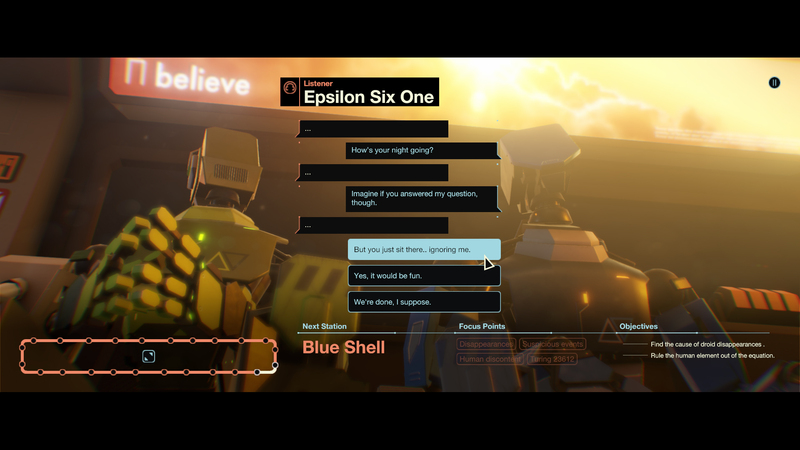 These are questions that Subsurface Circular makes you think about and, ultimately, allows you to find your own answers to. It’s not all serious, though. Mike Bithell’s writing is both clever and witty, providing plenty of laughs along the way. The team’s previous two games, Thomas Was Alone and Volume, also make an appearance here. And they are woven into the story in such a way that they serve as not only charmingly self-aware Easter eggs but also as a logical and integral part of the world. The gameplay is more substantial than you’d expect from what at first appears to be a text adventure. And while reading text and choosing dialogue options is certainly a big part of it, there’s a surprising amount of puzzle solving to be done as well. This ranges from giving a Tek directions by using your map of the subway to using focus points. These are little clues that unlock through the conversations you have, and can be selected to unlock more dialogue options on either the Tek you got the clue from or other Teks. The game uses its limited tools (dialogue options, focus points and the subway map) to great effect. And for such a small amount of core mechanics, there’s a lot of variety to be found here. The puzzles are not difficult by any means, and even if you do get stuck at times (such as me), the game will often provide multiple ways to help you out. But they are engaging and really help to sell the feeling of being a detective. 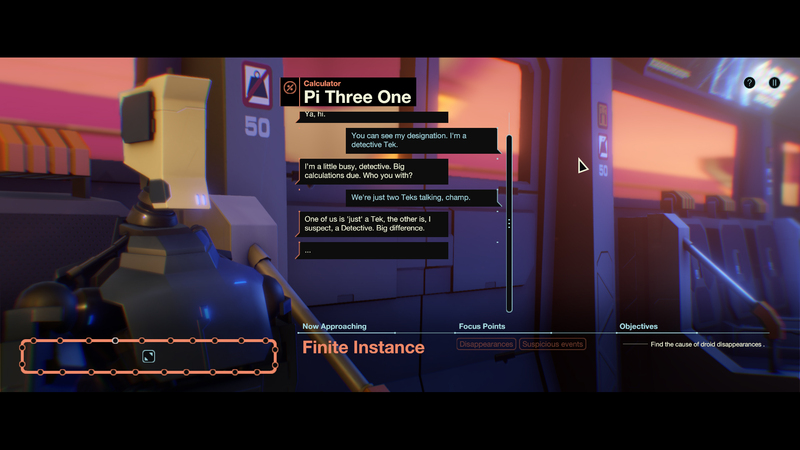 Another way in which Subsurface Circular moves away from more traditional text adventure is the presentation. Instead of only showing text or simply using still images as a backdrop, clean and stylish 3D visuals help immerse you in the game’s world. The characters have unique and interesting designs and they move to accentuate the things they’re saying. The UI isn’t anything flashy but it’s sleek and readable, which in a game like this is incredibly important. Subsurface Circular also sports a wonderful soundtrack, using both original and already existing tracks by Dan Le Sac. All of which fit the theme perfectly while making sure not to distract you from the walls of text you’re supposed to be reading. I’m of the opinion that it’s not how much time you can spend on a game but what the game does with that time that’s important. And Subsurface Circularhas certainly proven to use it well, making up for its lack of scope in polish and creativity. It didn’t leave me amazed, but every aspect left me satisfied. And there aren’t many games that accomplish what they set out to do with so few faults.